The title of this post is actually incorrect. Predicting the future is next to impossible! Here are a few recent examples (out of 1,000’s) of farm-focused predictions being way off. In August 2010 the USDA raised the corn yield estimate from 163.5 to 165.0. The final yield came in at 152.8. The USDA’s Crop Condition ratings and numerous “expert” crop tours were way off in estimating the 2010 corn crop only weeks before harvest. Predicting the future is hard. In June 2012, the USDA’s chief economist Joseph Glauber stuck by his forecast for record production, a substantial rebuilding of ending stocks and “significantly” lower wheat, corn, and soybean prices in 2012/13. He couldn’t have been more wrong. Predicting the futures is hard. During the harvest of 2014, due to a very good crop, many commodity experts falling all over themselves in regards to who could predict the lowest corn futures price. 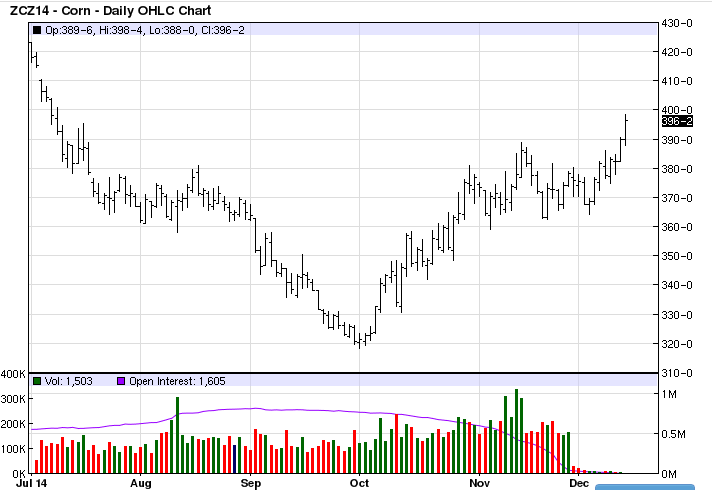 For example, in early October 2014 Goldman Sachs issued a three and six month corn futures price target of $3.00. What did corn prices do? See the chart below. Here are a couple more examples: 1) the near certainty of a 2016 drought by a certain weather forecaster and 2) the winter 2015/2016 gloom and doom in regard to soybean prices. The two main factors that affect a farmer’s bottom line, weather and commodity markets, are impossible to predict. Every farm needs to find a system to filter through the constant noise and make the best decisions for their farm on any given day. HarvestProfit’s software platform is a great tool for implementing a numbers-based approach that reduces the focus on predictions. Even if you don’t want to use software to help, it’s important to constantly remind yourself that predictions are constantly wrong (I have to). Should you base your farm’s net worth on a prediction that has the same odds of being correct as a coin flip? I say no. Find a system that works for you to help filter through the constant noise and predictions.